This item is an image. It was created by an unknown creator on or around the date time period: c1930s. 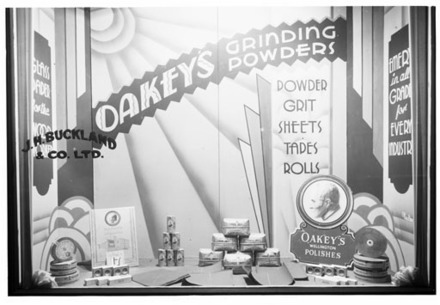 Shop window display of industrial products, in art deco style graphic design. The products are all made by the company John Oakey and Sons Ltd., polishes, powders, emery and glass papers and abrasives.